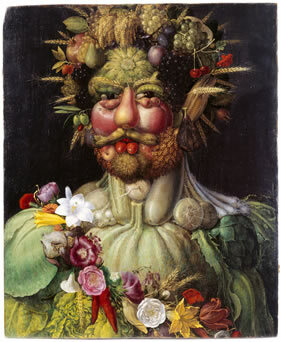 With paintings that put together flowers and vegetables with human forms it seems like Guisippe Archimboldo wanted to simultaneously show seasonal changes and the singular creative power of certain individuals. Archimboldo´s work contains a fantastic biomorphic inventiveness. Looking at this singular work of art with an art-historical gaze, Kac continues to describe Archimboldo´s virtual reality as an important contribution in the process leading up to the field that Kac calls ”L´art transgenique”, or transgenetic art (an art practice informed by genetical engineering). 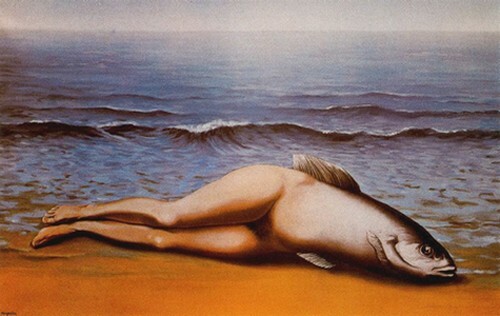 René Margritte´s L´invention Collective, resembling a stranded mermaid (the head of a fish with a woman’s legs instead of the opposite) might serve as an example. The point of this anagrammatic anatomic exercise is, according to Kac, but one of many examples of the 20th century´s constant redefinitions and reevaluations of the limitations of Man as well as (our) biological principles. At the end of this art-historical evolution we find Kac himself with his visions of an artistic “subject” that can produce (artistic) subjects (“art as a subject, no longer as an object”) – thereby aiming to transgress the “dissolved” subject toward a heterogenous, baroque “hyper-subject” where the word ”subject” can of course also be simultaneously interpreted in various ways (as in: the matter discussed, new branch of study, someone undergoing treatment, somebody or something represented in an art-work, the main person, theme, etc.). The way, in which this word is, understood changes the implications of his statement in a radical way. In this context however, Kac was speaking of his ambition to engineer a dog. The “Baroque” artifacts are characterized in a similar fashion to that which has been called “Media Art” (and now as all “unstable media” becomes Art in general and thereby loses its specificity), namely by a rather exuberant expression that somehow seems to lack an ”Aristotelian” poetic structure of beginning, middle and end. Instead it can, in the best cases, have a more dynamic narrative where the middle, with Gilles Deleuze’s words “seems to be everywhere” (Deleuze, Kafka: Toward a Minor Literature). I do not, however wish to go as far as Lev Manovich and state that the narrative is dissolved through an increased use of “multiple windows”. If narrative would disappear due to a dissolve of time and space (and perhaps become only a series of timelines) and if we were to fulfill the idea of breaking down language mechanically – maniacally the very idea of breaking it down disappears. In this context I would rather argue that the presented representations or images do not move forwards or backwards, but rather in depth, through a complex interplay of masks, naiads, pictures within pictures, etc. It is more a question of conceptual misplacing, cut-copy-paste, or from a political perspective, even copy-left and copyright, than it is one of cut-ups. For similar reasons it might be relevant to speak of media-based art in relationship to the baroque when concepts like “a new renaissance” still show up in the theoretical field. The honeymoon, the”renaissance”, that is to say the days when new media was (a new media and) “open sea” and the new sciences would give us enlightenment is over. After a period where we seriously believed that algorithms could fall in love with algorithms, we now find ourselves in a constant search for position from which we can speak. Baroque and contemporary (Media-) Art have a point of view in common: the “physical” or “tactile” world appears as illusive. 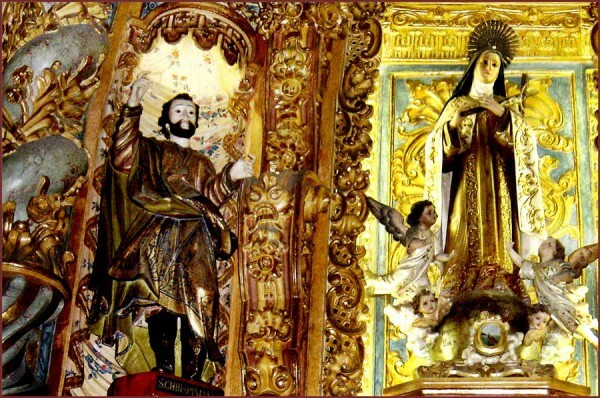 The Baroque vision in its contemporary modes is also clearly presented in filmic examples such as Vida es un Suenö, Prosperos Books, The Forbidden Planet and of course in the example that we perhaps can mention once more after years of overexposure within academic discourse; The Matrix. Or as trans-media artist Maurice Benayoun might have expressed it; the actual trend in these examples “is the world becoming a fiction” (VERGE, Moderna Museet, Stockholm 8/4 2006). The border between what can be seen as real and what is perceived as fiction is in other words a central question for the Baroque as well as for our time. This is not about stepping back into the (platonic) cave. What we call “virtual” is from our point of view just as real as the “represented” and the ambition in Virtual Reality can in principle be described as introducing the symbolic into the real world rather than a mimetic likeness of some other “reality”. One of the most radical contemporary examples of the power of symbolic reality might be the attack on the Twin Towers. In the words of Benayoun: “Nine eleven is the symbol that hits reality”. We theoreticians seem to miss this fact every now and then. Not only when we speak of the Baroque as well as VR and other so called new media artworks (or sometimes even terror-acts for that matter). Perhaps this is because we often speak of the represented subject, object, or whatever it is that is we are theorizing about as if it were a, or even the position of the position that produced (the) representation. Art as a material can realize new realties and not just realistic realizations. “Materialized” realities that furthermore (want us to) realize that the “reality” we thought that we could relate to in a more or less objective way, in reality is dependent of the perspective of our original vantage. 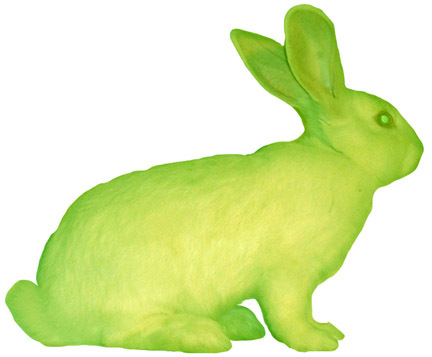 For example, in Eduardo Kac´s glowing bunny Alba from 2003, which he describes as a”media piece” we do not know if this genetically engineered rabbit exists in the physical world or not. Kac claims that he did not get permission to take the rabbit out of the lab and we must make do with an image that could be (re)produced in any modern home with basic photoshop technology. Massmedia chose to interpret this differently and the symbolic green rabbit initiated a major discussion on biogenetics and the limits of artistic freedom. Technically speaking Alba is not even especially spectacular – scientists have been inserting GFP in genes to study embryonic development, for quite some time and so far no adverse effects on animals have been observed. Kac simply shifts the context in which it is being used. The reception of this piece furthermore makes the question of its”real” reality secondary to the effects of its symbolic reality. The position of the creator of artifact and the symbol it has become is not necessarily the same as that of the artifact or the symbol. One might even claim that it is not the artist who has created this symbolic reality but rather the contexts in which it has been represented. 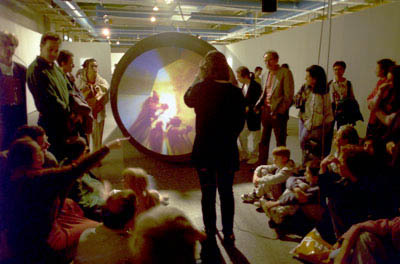 Eduardo Kac, Genesis, 1999. Transgenic artwork linked to the Internet. Installation view. In the genetic project Genesis, one of the key elements is an “artsitic” gene based on the Old Testaments declaration of mans dominion over animals (“Let man have dominion over the fish of the sea, and over the fowl of the air, and over every living thing that moves upon the earth.”). Kac has via Morse-code and the code commonly referred to as genetic base created bacteria exposed in a spectacular way. The sentence of course implies the notion of Mans sovereignty over nature, and Kac claims that he used Morse code since it represents the “genesis of global communication”. The audience is encouraged to intervene and their presence effects the genes evolution, physically (through the temperature-changes etc, due to their presence in the gallery) but also through Internet intervention. 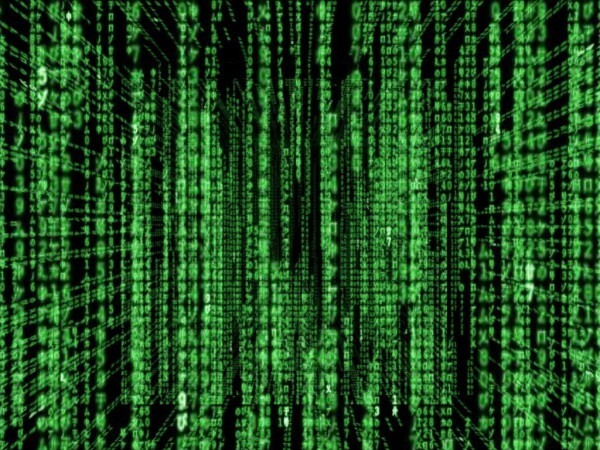 With this “illusion of communication” we should carefully note that there is an important “difference” – between seeing these codes as an ontic description (one that relates to existence) and shifting towards an ontological theory (of being) subduing code to an onus (that takes the blame for the state of things). This basically means that one should take care before assimilating the idea of a world entirely made up of information and molecular processes. It can easily seduce us to what might be called an “informational ontology” where all that is, is and is information, and in the unlikely event of this information revealing itself as something in itself, we will certainly end up in some form of hyper-materialism or perhaps even hyper-ideology where all subtle argumentation is reduced to something meaningless. In Eduardo Kac´s work the relationships between language and code within biology and technology seem to be central themes along with the idea of Man as Demiurge. In Leibnitz’ Monadology we can find a model which apparent struggles with the tension between informational ontology and what might be called the ontics of code are striking. Gilles Deleuze means, in his book, The Fold – Leibnitz and the Baroque that Leibnitz, on the one hand wants to prove the correctness of his own arguments or even their reality and that he, on the other hand wants to reach the nature of God. We are, according to this depiction of Leibnitz’ ideas ourselves, and are this in strength of our capacity to express what we are. Our essence or idea can be said to include everything we express, and since it expresses our unity with God himself, it has no limits, and nothing transcends it (Discours de metaphysigue, §16). Deleuze has shown that the unity of body and soul (in Liebnitz) must be thought of as non-causal since pure causality only would be a particular case of a more general principle. Furthermore Deleuze means that identity; or rather quasi-identity is that identity which exists within an “invariant” of this more general principle (Deleuze, Expressionism in Philosophy: Spinoza). He therefore also means that Leibnitz’s monad is nothing more than Spinoza’s modus, which for Deleuze means the “individual as expressive center”. The quasi-identity is in other words its own qualitative hub, the node for its “being in the world”. The world, as it is expressed through every single monad is therefore a constant change equipped with singularities. It is around these singularities that monads are formed as expressive center(s). Soul and body are in other words not split into two different substances like in Descartes. Basically, one could claim that everything is “soul” (nonmaterial), and that the bodies’ experience-world is the way in which souls are given. With a background in concrete-poetry Kac also seems to have an interest in the literacy of things. A literal look at this thing we call a computer with Leibnitz in mind can perhaps tell us that the expressive center of a computer is very simple: A diode can either transport electrical energy (1) or be non-transportive (0), a magnetized and iron-oxidized surface with its poles in one direction (1) or another (0). Every such signal is referred to as a bit. When several 1: s and 0: s are combined this is called a byte. If a document is 900 kilobytes it in other words contains approximately 900 000 different combinations of 1:s and 0:s. One might even claim that Leibnitz sees God as a programmer. God does not create all the details of the world, but creates possible programs within him and picks out the best of them – in short, God chooses the inherent ”logic” in these programs. Each combination contains the information which enables letters, numbers and the space in-between them. But it can also be any form of digitalized information such as pictures, icons, sound, parts of films, VR-installations, this text when it is being written or the base of a constructed gene. There are many languages that translate the”off” and” on” signals needed in order to create the virtual letters on my computer screen (that correspond to the keys on the keyboard) when I am writing this particular essay -who ever this I might prove to be, and before it has reached a material manifestation (ink on paper) it has undergone several translations and transitions with its ”essence” hopefully intact throughout this whole process. Eduardo Kac, Move 36, 2004 (detail). He says that the” The creation of this gene is a critical and ironic gesture, since Descartes considered the human mind a “ghost in the machine” (for him the body was a “machine”). His rationalist philosophy gave new impetus both to the mind-body split (Cartesian dualism) and to the mathematical foundations of current computer technology.”(http://www.ekac.org). The”Cartesian gene” expresses itself through the plants curled leaves. 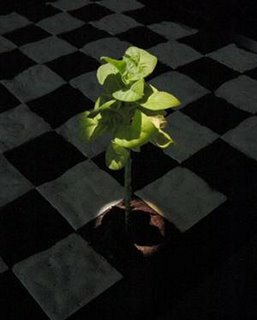 The plant is rooted on a huge chessboard and grows on the square where a man supposedly lost against a machine. It is illuminated by a single strand of light and exposed together with video projections on two sides. The projection is also composed like a chessboard, with separate ”organic” animations within each square suggesting the enormous amount of possibilities that change with each move. In what I here choose to interpret as ironic references to Descartes, Kac exposes this dualistic thinking as the very foundation (algorithms and/or data) of computer-technology and genetics, at the same time as he is critical towards it. He works performatively with the very media that he wishes to question: represents in order to question representation. Both Kac and Maurice Benayoun are interested in the “human factor”, i.e. Mans´ impotence in relationship to technology. But they also have an interest in mans need to keep technology impotent. In these two examples we see a constant search after position that simultaneously always positions itself. 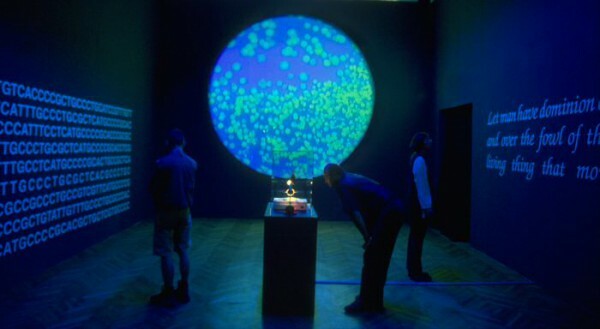 Eduardo Kac, The Eighth Day, 2001. 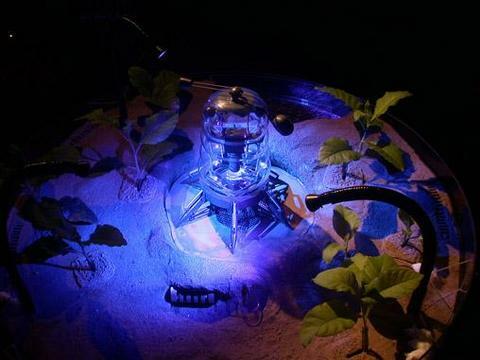 Living transgenic life forms and a biological robot in an environment housed under a clear 4-foot diameter Plexiglas dome. But the work presented is still extremely ”realistic ”and ”believable” which brings us to a question insinuated in Manovich and which also might ask in this context – namely why we still look to represent in the same manner as those before us. Why photo-realism for example still seems to be such a central theme in a more and more digitalized visual culture, in a similar way to the Baroque artists’ insistence on working with representational motives even though they, as the hangover of the renaissance a priori knew that representation as such, never would be enough. Perhaps an investigation of notation and the musical sides of the Baroque and the dominance of the imitational counterpoint, or in relation to the polyphonic could give us some clues as to what we are trying to find. Perhaps it just reveals the uncertainty between science and fiction that we are experiencing in our own (perception of) reality, our own presentation or re-presention of reality? We might eventually even ask if baroque media art is capable of poising the question if we, as ideas, ever will be sufficient for ourselves.